Take a 4qt stock pot and warm over med-high heat on the stove. Add some olive oil and brown andouille on all sides, remove from pan, slice into coins and set aside. Add butter and when browned add onions and reduce heat to cook very slowly. Cook until onions are caramelized, 30 mins. Add garlic, saute 1 min then add andouille, stock, vermouth and spices. Stir, bring to simmer and cover with lid slightly ajar. Simmer 30 mins until done. Serve traditional style with toasted french bread rounds and cheese or do like I did. 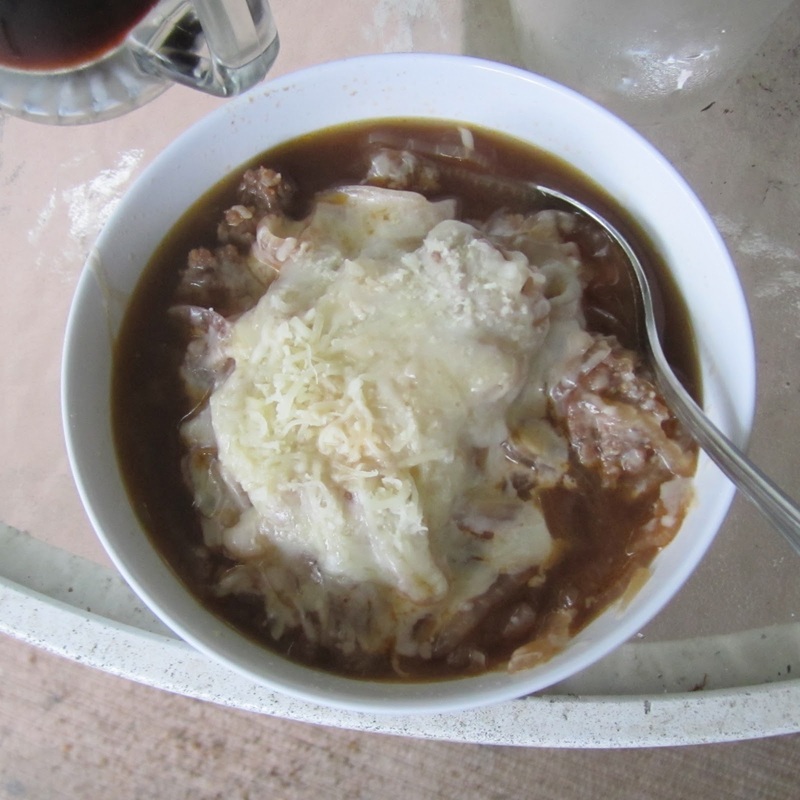 Place about 1C steamed brown rice in soup bowl and add onion soup. Cover with Sargento shredded 4 cheese mix and a couple shakes of Parmesan. The heat from the soup will melt the cheese as in the picture above. Something new I'm trying is to pair beer with my dinner. In this case I chose Aecht Schlenkerla Rauchbier Urbock (try saying that 5 times fast). I was able to purchase this from Total Wine for $2.89 for 500ml bottle. 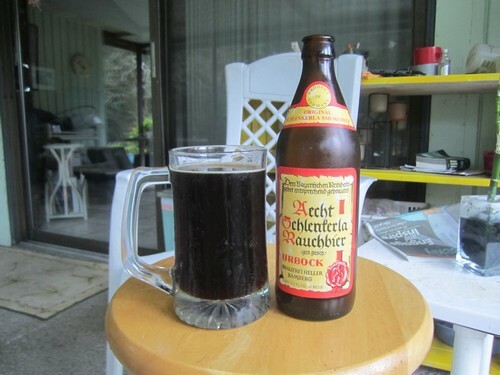 The German Rauchbier or smoked beer is a style where the malt has been smoked over wood fires and this lends a smoky taste to the final beer. It went extremely well with the spiciness of the soup being moderated by the maltiness of the bock and the smoky taste played well with sausage in the soup. If Rauchbier isn't to your taste you could try a normal Bock beer like Shiner.